Lee Majors, Lily Matland Holly, Amy Redford and Bernie Casey. Though she has traveled from New York to Los Angeles for numerous aspects of theater and film, Tonya S. Holly prefers to work at home. The writer and director of the new feature film "When I Find The Ocean" shot it mostly in the Shoals area of northwest Alabama, visualizing scenes from her childhood while writing the script. "I think sometimes it's hard for people to believe I live here and do what I'm doing," said Holly, a University of North Alabama graduate who has worked on more than a dozen feature films, including "Toy Soldiers" and the Oscar-winning "Blue Sky." "I always knew I wanted to do my films here in Alabama as much as possible," she said. As most theater graduates do, she tried acting in New York and Los Angeles, but later moved back home, contacting the Alabama Film Office and others about finding film work. "Blue Sky" was shot in Selma, but mostly she's traveled for CBS, HBO, NBC, FOX, Morgan Creek, Universal, Buena Vista and other productions . She formed Gem-Star Talent Agency in the Shoals in 1989, then created the Alabama Filmmakers Association in 1991 to stimulate the industry in the state and help develop sound stages in northwest Alabama. Between traveling gigs, Holly worked locally, producing and directing plays, commercials and the music video "This Day," gathering a historic group of Muscle Shoals musicians to record a CD titled "One Voice." On a little down time as an extras casting director for a CBS project in 1994, she was chatting with crewmembers, and remembered a childhood belief that led to "When I Find the Ocean." As a child of about 7 at her grandmother's house, Holly once walked barefoot down the creek, assuming she'd eventually reach the ocean. She got scared and headed back home. The memory stayed with her. 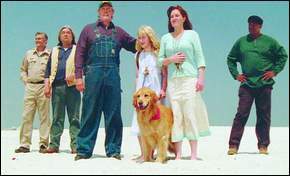 The movie revolves around a young girl in 1965, seeking to leave an abusive home, who sets out down a creek to find the ocean and somehow reconnect with her dead father. In that volatile period in Alabama's history, her journey brings her across plenty of potent stories. "I knew where I wanted to shoot this film. All the landscapes, when I was writing, were already in my mind," she said. As Cypress Moon Productions, she wrote, produced and directed the 2003 short film "The Mirror," winner of Best Homegrown Short at the Sidewalk Film Festival and Overall Winner at the Chicks With Flicks Film Festival in New York City. Thus encouraged, she developed "When I Find the Ocean" as a feature-length project. Most filming was done between Red Bay and Tuscumbia, with the exception of a small general store across the state line in Tennessee. She attracted name talent for leading roles, including veteran actors Dianne Ladd, Graham Greene, Bernie Casey and Lee Majors. Shoals and Alabama talent on display include her daughter, Lily Matland Holly, as the 12-year-old heroine, George Lindsay (a Shoals native best known as Goober from "The Andy Griffith Show" and "Hee-Haw") and a couple of University of Alabama graduates, Richard Tyson and David "Shark" Fralick, both of whom walked on Bear Bryant's football teams. Fralick has done lots of TV, including several years as Larry Warton on "The Young and the Restless." Tyson has had supporting roles in hit features such as "There's Something About Mary" and "Kindergarten Cop," where he played Arnold Schwarzenegger's nemesis. Many of her crew and other cast were locals, some working on their first film. "I used as much as possible from Alabama," Holly said, including hundreds of support businesses. Securing funding, as is so often the case with smaller companies, was nail-biting, down-to-the-wire stuff. She started with $1 million banked, but knew the project would require 10 times that much for completion. Some backers got cold feet. So each day, when she'd finish shooting, she'd start making calls, eliciting support. At the end, it will be a $10 million project. Holly cut her own pay to get it done. After screening it at festivals around the country, Holly cut a distribution deal with Cinamour Entertainment, which presented "When I Find the Ocean" at the Cannes Film Festival in May. Holly is packing up gear and showing it around the state, with upcoming screenings in Selma and the Shoals. After that, it will likely be aired on television, then DVD. Cypress Moon is developing her "The Story of Bonnie and Clyde" script now. To her disappointment, most of that film will be shot in Louisiana. That's where the money's coming from, and that Southern state, like so many others aside from Alabama, offers financial incentives to filmmakers. What many forget, blinded by the glitz and glamour from Hollywood, is that filmmaking is a business. "As a businessperson, I have to go where the money is," Holly said. "And incentives play a huge part in that." Many casual moviegoers don't realize that 65 percent of what they think of as Hollywood product gets shot far outside Hollywood. Canada started the ball rolling in the late '90s, with various provinces offering as high as 50 percent rebates to shoot there. So Hollywood traveled north. Various U.S. states got into the act, among them New Mexico, Louisiana, New York, North Carolina and South Carolina. Florida, long an attraction for filmmakers, didn't think it had to offer incentives, but finally caved, as others did across the country. Most Southern states now have some form of incentive package. Alabama, as is so often sadly the case, trails the pack. "We're trying to make the state more aware that filmmakers create a product, just like any industry," said Linda Swann, director of the Alabama Film Office. It's a clean industry - meaning as a factory, it doesn't create messes - and despite its year-to-year nature, has benefited other states, such as North Carolina, to the tune of tens of millions annually. Filmmakers love all the locations in Alabama, its versatility. "We can go back to the Civil War, to the time of Native Americans," Holly said. "From history to the moon. "We have rivers, swamps, beaches, mountains, caves." Just about the only thing Alabama can't produce is a desert. "And we haven't tried that," Swann said. But after drooling over the state's natural resources, filmmakers then ask, "What can you do for me?" Louisiana's filmmaking incentive act was actually based on a proposal drawn up under former Alabama Gov. Don Siegelman. Mississippi looked at that plan as well, for its own package. A refund or rebate on products and services, everything from construction materials to catered food. Swann believes those should be offered to both out-of-state production companies looking to shoot here, and in-state filmmakers hoping to keep work at home. For in-state filmmakers, the AFO would also like to create a pool of money, available at low interest rates, for filmmakers to invest in the early stages of the process, when it's needed most. If those incentives pass - one didn't get to the floor last session, and the AFO is working with a team to draft new bills - the AFO has further dreams of schools for filmmaking, studios and production houses. "We didn't have a car industry until the state offered incentives to Mercedes," Swann said. Despite legislative inaction, Alabama filmmaking is in many ways stronger than ever. Tim Burton filmed his big-budget 2003 film "Big Fish," based on the writings of an Alabama author, in the Montgomery area. Twice Oscar-nominated writer-director John Sayles ("Lone Star," "Eight Men Out," "Matewan") will shoot his new film "Honeydripper" in Butler County this fall, after scouting locations in Louisiana, Arkansas and Mississippi. Homegrown filmmakers such as Holly, and the Huntsville group currently shooting the science fiction thriller "Like Moles, Like Rats," continue to maintain hope for the state. Now in its seventh year, Birmingham's Sidewalk Moving Picture Festival sees more and better locally produced films in competition every year. "When we started, there really weren't a lot of local filmmakers producing their own content," said Erik Jambor, Sidewalk director and co-founder. "We probably ran most everything we could get our hands on, student and otherwise." But over the years, the quality and quantity have grown exponentially. Sidewalk can modestly claim its part in that. "I think certainly we've been instrumental in serving as a catalyst, exciting people with the exhibition possibilities," Jambor said. As the three-day festival (Sept. 23-25 this year) has grown, it has added features such as the Scramble, a 48-hour filmmaking contest; Sidewrite, a short screenplay (15 pages or less) competition; and Sidetalks, offering a chance to interact with filmmakers. "You can actually sit down with someone like producer Peter Gilbert of 'Hoop Dreams,' and discuss it either from a filmmaker or audience perspective," Jambor said. Sidewalk Cinematheque happens around the year, showing films that couldn't be slated during the festival's fall weekend. And filmmakers gather at a local restaurant for social/business sessions, for locals to connect, but also to hear talks on the technical and business sides of filmmaking. "So Sidewalk goes beyond just showing films; it really kind of goes to the gut, the business, the hard part about making films," Jambor said. Incentives will be crucial in drawing big-budget films to the state, but in the meanwhile, high-quality independents such as Sayles' "Honeydripper" can only do us good, he said. Aside from the product itself, a film process leaves behind experienced cast and crew. Having those resources on hand makes filmmakers more likely to want to work here. But the bottom line is still the bottom line. "There are still some people we have to convince that film is an industry," Swann said. "But the people who really benefit are the local hairdressers and carpenters and actors and filmmakers. It doesn't all go to a star's dressing room."